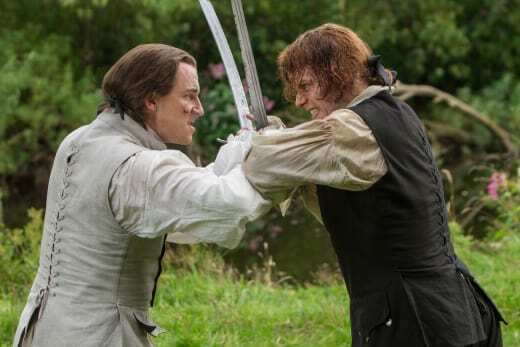 Claire and Jamie's rift over her request to put a moratorium on killing Black Jack Randall didn't even last until the beginning of "The Best Laid Schemes..."
Then again, because of Randall's wicked ways, Jamie called off said moratorium and was dueling Randall by the closing scene of Outlander Season 2 Episode 6 anyway. Not a whole lot happened during this hour, but it's pretty obvious it will all come back into play in upcoming episodes. Prince Charles and St. Germain made a mess of things for Claire and Jamie first. Well, sort of. They were just being themselves. It sure seemed like Jamie and Claire were just trying to poke the hornet's nest, anyway. They have a lot more faith in themselves than I have faith in them. Their big plan was to make it appear as if all of St. Germain's men came down with the pox again so the harbor master would feel the need to quarantine the men and burn the warehouse and all the wine. Surprisingly, they got away with the beginning of that plan, using what appeared to be only two bottles of sullied wine and Fergus rubbing nettles on the inside of his men's clothing. 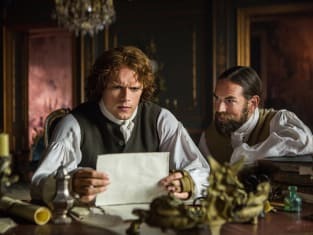 When St. Germain and Charles had another idea to get the wine to safety and sale before the harbor master caught wind of any pox, Jamie had to go along with it, but he and Murtagh had to also thwart that plan. There's no way St. Germain isn't going to figure out everything at some point and get his revenge. Right? Especially with Murtagh gone right after the holdup selling wine. What wine? It was all stolen! It just seems like Jamie and Claire think they're the smartest people in France and the rest are country bumpkins. 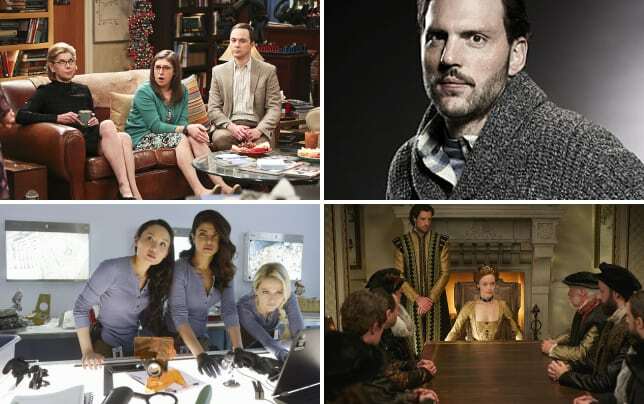 In other news, I'm still not over Claire's meddling in the timeline. Yes, let's just get on with it. Isn't everything else insignificant after the final scenes! It appears there other ways to ensure someone is not baby-making material, whether they are in your (or Frank's) family tree or not. 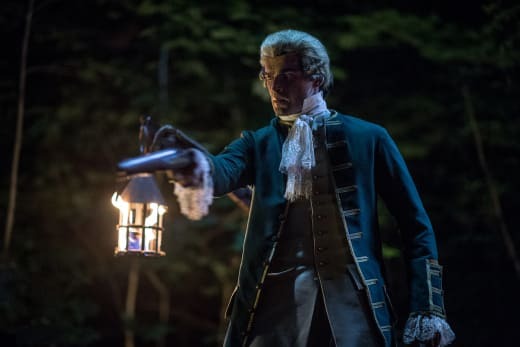 The odds are pretty good Jamie made a little dent in Jack Randall's ability to father children with his swordplay, am I right? In her quest to just stop the one event from occurring, Claire didn't take into account the many other possibilities that are between that family tree and Frank's birth. And she is probably going to lose her child as a result. I hate to blame her for that possibility, but wasn't the bleeding a close enough call for her? At what point does her unborn child become more important than the life of Frank in the future? Claire hasn't been thinking in terms of the timeline of events, and the idea if Frank isn't born she won't be in Ireland and so on and so forth. From what I can tell, she's thinking of Frank's life independent of the rest of that (whereas a weirdo like me would be thinking quantum physics). In my eyes, she just put Frank before the life of her child. Why am I being so hard on Claire when Jamie isn't that hard on her? I seem to have something against Claire, and I'm wondering if it's in the portrayal on the series, because I never remember feeling like this from reading the books. Can you book readers help a girl out? Does Claire come out as Frank-ish in the books? Which is weird, because I like Frank, but I don't care if he has a life if it means the baby dies. And what's more, she's already been witness to how difficult things can be with childbirth in the 1740s. She helped Jamie's sister deliver a breech baby, and if she hadn't been there, both lives would probably have been lost. The time she is in is difficult, medically speaking. Claire knows her own expertise is often better than full blown physicians of the era. Unfortunately, if anything happens to her (and it has), she can't really help herself out. The whole thing is just awful. Claire was probably angry with Jamie, too, believing he just went back on his word to her for some unknown reason. Although, he did earlier make a point about believing that wasn't a promise he needed to make in the first place. Jamie: I've been thinking. Remember you said I owe you a life because you saved mine? Well, I saved yours as well at least as often. Seems to me we're even. But it sure seemed that Jamie more than likely found Randall in a compromising position with Fergus, or at least found Fergus running for his life from the dastardly man. After all, Fergus was sniffing around a room with that damn red coat. And we know enough about Randall to know he shouldn't be around unaccompanied little boys. Will they blame Randall or themselves for what will happen with the baby? 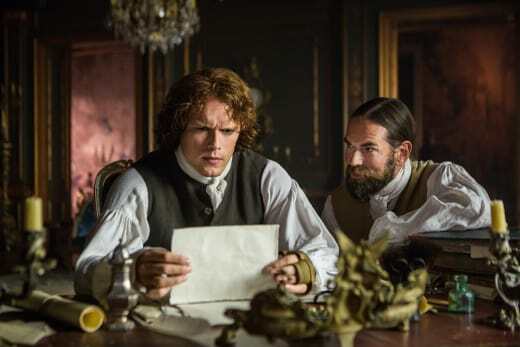 Murtagh is finally in on the secret of Claire's past...that it's their future. Jamie asked Claire for her own promise...to go back through the stones to a man who loves her as much as he does should anything ever happen to him. That was heavy. There was a mention of Geillis. Will we see more of her again soon? Was Claire's warning to Master Raymond the last we'll see of him for a while, or was the foreboding of some other sort? I'll miss that shop. I'd love to hear from you, so drop me a note below in the comments! Jamie: Promise me if the time should come, you will go back through the stones, back to Frank.